Major warmth plus touchscreen convenience. 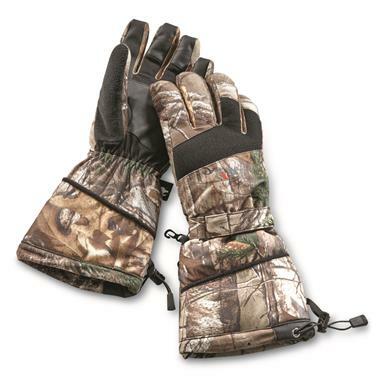 Insulated Hunting Gloves with ALL the amenities you could want. They feature a waterproof insert and 150 gram ThinsulateTM Insulation, so they're warm and dry above all else. Second, they feature touchscreen-friendly PU tips on the index finger and thumb that let you use your smartphone. So yes, you can take that phone call from your wife, even though she totally knows you're in your stand right now. 100% polyester tricot fabric is soft, warm, and quiet, so it won't give you away. Odor-X antimicrobial lining prevents odor-causing bacteria. Add it all up, and you're looking at our most full-featured Hunting Gloves. Guide Gear Touchscreen Friendly Waterproof Gauntlet Hunting Gloves is rated 5.0 out of 5 by 1. Rated 5 out of 5 by Deaker from they keep your hands toasty! I got to use these gloves to shovel snow today. It was about 20 degrees and it felt a lot colder with the wind, but not my hands :-) The gloves feel quite thick and sturdy. They are a bit snug, but I assume that will approve with wear.